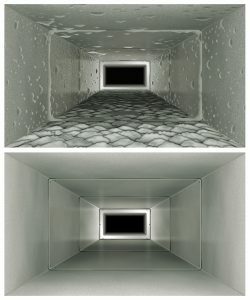 Have you ever invested in duct cleaning in Gainesville, FL? This may not seem like a very important service, but it does actually come with a number of benefits. While it might seem like your air ducts are just a minor part of the entire heating and cooling system, they are actually very important to the operation of both! If you want to keep your home comfort systems functioning as efficiently and effectively as they can, and keep your indoor air quality high to avoid aggravated allergies, then you should make sure that you get your ducts cleaned on a regular basis. One of the main purposes of duct cleaning is to help improve your indoor air quality. Dust is just one item of debris brought into your home through your ducts—you can also end up with pollen, dander, germs, mold spores, and more, circulating their way through your indoor air. The fact of the matter is, today’s homes are tightly constructed to allow for the best efficiency from your HVAC systems, but this doesn’t do a whole lot to filter out the debris that can be impacting your allergies and making people in your household sick. And this debris gets blown around the home every time you turn on your climate control system. Breathing all this in can cause all sorts of health problems beyond simply just allergy symptoms—this includes the flu and asthma complications. Professional duct cleaning, however, helps keep your indoor air quality high, by removing these contaminants from your home, so you can use your HVAC systems without exposing yourself and your household to all sorts of negative health effects. You’ll breathe easier, and hopefully not have to deal with allergies or illness. Duct cleaning doesn’t just benefit your indoor air quality, it also helps improve your energy efficiency! As dust and dirt collect inside your ductwork, it starts to insulate the ducts. This restricts the flow of air through your ventilation system, making your heating and cooling systems work harder to do their job. As a result, you’ll find yourself paying more month to month while having a harder time keeping your home at a comfortable temperature. When Should I Schedule Duct Cleaning? If you’ve never had it done before, then it’s a good idea to get your first duct cleaning session in as soon as you can. You’ll help your HVAC systems run more efficiently as a result—remember, even though we don’t use our heating systems as much as other parts of the country do, we still want them to work efficiently when we do need them! We’re happy to answer any questions you have about this service when you call our team. And remember, ducts are not easily accessible to the untrained hand—it’s best to trust a pro for this job to prevent damaging your ductwork further and hurting the effectiveness of your HVAC systems. At North Central Florida Air Conditioning, we are “Improving Lives by Improving Homes.” Contact us today!